FFWPU Europe (Bratislava, Slovakia, 3. December 2014): In December 1989 the so called Velvet Revolution reached a new climax by opening the borders to the “capitalist” neighbor states. Czechs and Slovaks were open to welcome new ideas and religions too. Unfortunately, the opening and renewal lasted only few years. With the advent of new religions also the campaigners of the notorious anti-cult movement poured into East Europe and Russia. Smear campaigns triggered a wave of persecution, which lasts until today. “In the last years the situation has worsened in fact”, says Peter Zoehrer from the Vienna based Forum for Religious Freedom Europe, FOREF. To commemorate the 25th anniversary of the Fall of the Iron Curtain, UPF Slovakia decided to highlight the turn of events. UPF secretary general Milos Klas and his wife Barbara organized the event „Religious Freedom in Eastern Europe after 1989. Has persecution changed the target?“ The intensive advertising by mail was complemented by six days leaflets distribution at the Comenius University. 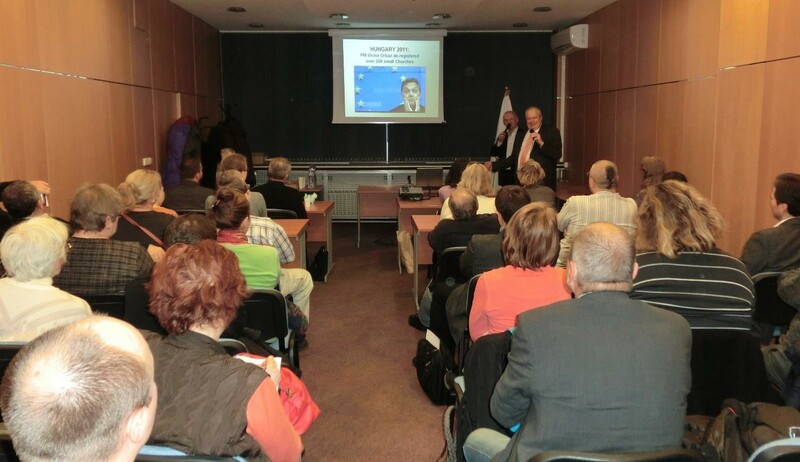 The event took place on December 3, in an office building in downtown Bratislava. Despite rainy and cold weather around 40 people accepted the invitation to discuss religious freedom issues. Lectures were given by the co-founder of the human rights organization FOREF, by a renowned Slovak historian as well as the bishop of the Old Catholic Church. The historian Dr. Lubomir Morbacher started by describing the tactics of the Communist party to destroy the powerful Catholic Church, and later on smaller communities. He spoke in detail about three cases, two Catholic priests of the “secret church” and Unification Church member Marie Zivna who were murdered. Peter Zoehrer inspired the audience with a varied presentation, ranging from the explanation of Article 18 of the Universal Declaration of Human Rights up to the influence of France concerning anti-cult policy in the East European countries and the former Soviet republics. A big headache are the activities of FECRIS which is sponsored largely by the French government. On top of that, the Russian extremist Alexander Dvorkin is now vice-president of FECRIS! Even once liberal states like Hungary have recently changed their laws. In 2011 Prime minister Viktor Orban caused an uproar with the massive deregistration of religious communities which resulted in a downgrading of their status. Concerned were about 200 religious communities, including Methodists, Pentecostalists, Seventh Day Adventists, Reform Jews, Buddhists and Hindus. Our guests were thrilled by the discourse of Archbishop Augustin Bacinsky about the “unseen borders and fences which divide humankind until today”. He delivered a rhetoric masterpiece starting with the tragic division in the first human family leading up to the confrontation of Democracy and Communism. He regretted the lost opportunities after 1989. Among the audience were the heads of the Old Catholic Church, the New Apostolic Church, Hare Krishna, Falun Gong, and other religious activists. 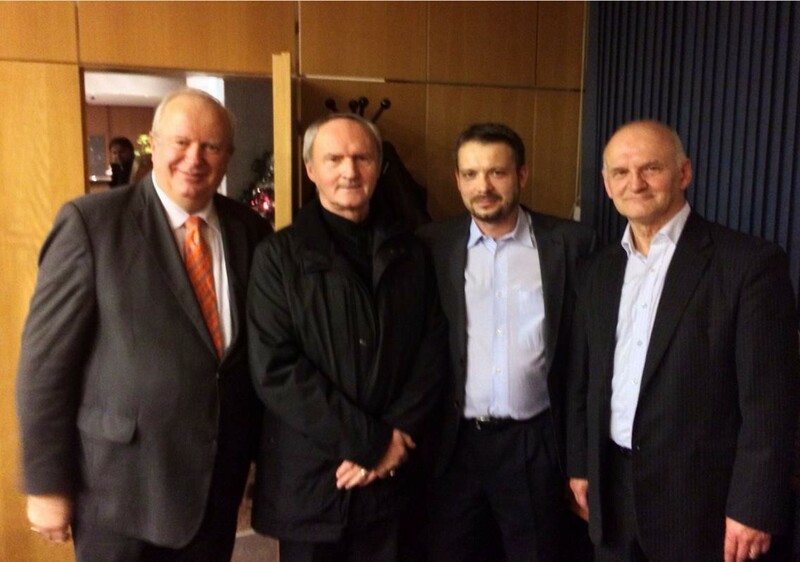 UPF Slovakia president Pavol Chrancok rose up and thanked Peter Zoehrer for helping during his court case caused by religious discrimination. A surprise was the presence of the First secretary of the Russian Embassy who was not too happy with the presentation of FOREF for obvious reasons. New guests received as a gift the book “As a Peace-Loving Global Citizen”. Nine guests made the long journey from the town of Nitra, which was the first Christian center in Slovakia after 800 AD. FOREF is specialized on the monitoring of official and public intolerance against religious minorities and advancing public awareness for their rights. Founded in December 2005, the NGO has gained much attention and respects from the religious communities as well as among experts thanks to the untiring efforts of Peter Zoehrer and a few supporters. In April, the internationally known human rights expert Dr. Aaron Rhodes became the president. FOREF alarmed the international public, when a Unification Church missionary was jailed in Kazakhstan a few years ago. It also took a very active stance to help the victims of kidnappings in Japan.